This week's Intuitive Tuesday card was Death reversed, which is about resistance to necessary change and clinging to the status quo, even in the midst of change. The Death card (in its upright position), is about letting the old die away to welcome in and bring in the new. When I shuffled the cards as I read through the comments, I was surprised and excited to pull the Ace of Wands. The card pictured here is from the Legacy of the Divine Tarot by Ciro Marchetti. I've previously written about the Ace of Wands here. If you remember, the Ace of Wands indicates new life, the start of a new venture or enterprise, new activities and things starting to happen. If you get a chance, refer back to the Ace of Wands post for more information about this card and how you can bring its energy more fully into your life. The energy of the Ace of Wands feels like it is in direct response to the energy of Intuitive Tuesday's card, Death (reversed). Where Death (reversed) feels stuck and stagnant, the Ace of Wands feels new, exciting and free. I believe this message is for each of the people who left comments. Thank you so much for your deep, thoughtful comments each week. I learn so many things from you!!! Laura Rose -- You are in the midst of Ace of Wands energy. I see it swirling around you as you launch into your Advanced Student project. Your energy glows as you "work" on this project....but it isn't really work, is it? This is what you are meant to do. Continue to flow with and bask in this energy of purpose and excitement. You'll be amazed at how this all develops. Quiet Dreams -- You too are entering into the Ace of Wands energy, even if reluctantly. I see a vision of a river, flowing beautifully through a canyon. You are clinging to something on the side of the river trying desperately not to let go. Are you possibly trying to fight your way back upstream? As you fight the inertia of the river (Ace of Wands energy), you are expending a lot of strength. What would happen if you simply trusted and let go? If that seems too overwhelming, let go a little bit at a time and see what's there for you. 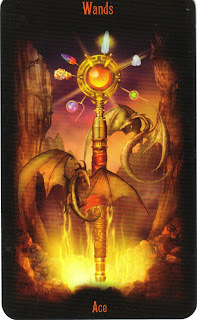 Tami -- One of your biggest strengths is your ability to flow with Ace of Wands energy. Newness, energy and action fuel you...they always have. And yes, there is also a need for stability and predictability. You have an uncanny ability to balance the two of these perfectly (stability without getting stuck AND movement without chaos). Perhaps the true gift is that you know which cheese to let age (stay the same) and when to move it. Anonymous -- I feel that things have been tough for you. Even people on the outside see how you've weathered many storms. But I get a sense that the real "loss" and accompanying growth is within your own heart. You are waking up from the inside out. Things look the same, but different as you go through this growth period. There is newness and Ace of Wands energy all around you. Keep tuning in to your intuitive voice and feel guided to make each decision along your path. Your faith in being divinely guided will help you to find peace and confidence so you will be able to sleep and won't feel as anxious. Lavendar Luz -- You asked the question -- am I stuck or being guided? I believe you are being guided and if there is a feeling of "stuckness," this delay is helping you pause just long enough for you to be ready to be un-stuck. There may be thoughts of what you "should" be doing and in what time frame, but know that this is a calculated pause and your project will be completed perfectly if you continue to tune in and listen. If you feel resistance as you move forward, you may be forcing it. Flow...with the Ace of Wands energy, even if that means a delay in your (logical) plans. Suzi Creme Cheeze -- As you step up and orchestrate the energy around you, you purposely step into the energy of the Ace of Wands. When FEAR creeps in, you may be trying to use your energy to trouble-shoot something that hasn't and may not happen.When you feel FEAR, remind yourself to stay present to best facilitate what's happening NOW. Have faith that you will create magnificent solutions along the way so there is no need to double your work by working in the NOW and in the uncertain and unpredictable FUTURE. It is all in divine order. Thank goodness! Kim -- I get the sense that you are anticipating an upcoming change (possibly career-focused?). Perhaps you have already begun to map it out in your mind or you intuitively sense that it is just around the corner. I feel an excitement as you wait to have this change manifest in your life, swirl around you and have you feel caught up in the newness and the excitement. Change is coming and it feels good! Bonnie -- I thought of you when I read the previous post on the Ace of Wands. Some of the questions I posed were: What are you being called to do? What do you want to bring about in your life? If you could do ANYTHING, what would you do? I don't get the "jump ship" feeling for you and your business, but I also believe that you and hubby might want to explore these questions to create possibilities. Then as you gain certainty in your direction, see how you can diminish the stale energy and increase the exciting Ace of Wands energy. It can be a gradual thing as you experiment and figure it out. Thank you, Sheri, for taking the time and using your wisdom, insight and intuition to focus on each of us. You are right on with your insights into my passion. And this card gives me hope in dealing with the difficulties where I work with MR/DD folks. I did not know on Tuesday that the Death card reversed meant that I needed to let go of someone there I care very much about. On that very day. Thanks again, dear friend. thank you! thank you! thank you! that is exactly what i needed to hear!!!!! During yoga recently, while I was having a conflict (in my head) with a person, my message was: "there is no Other." Today yoga today, I dedicated my practice to my project. And the message I got was: "even with this, it is not Other." Truly, I am so big that I encompass my project. It's a liberating thought, because it means I cannot fail. And then I read your spot-on post! And I'm curious as to the inspiration you received for yourself with this card? That Ace of Wands is changing things for me....off to Roswell (yes, the UFO Museum is there) for Census Enumerator training. I get to spend all week at the Soy Mariachi Center. So first the Let Go card...and now the chance to wave that Wand. Sheri, Thank you for taking the time to respond to all of us! The Ace of Wands makes perfect sense. Those 3 questions are exactly what we need to ask. "Diminishing the stale energy" and getting excited about new possibilities is exactly what we need. I will be asking myself these questions this week.